The Man Cup HTP Performance Nationals presented by the Motec In Control Series sizzled in the Memphis heat on June 20-21. Preceding the event on Friday was an afternoon of test and tune, followed by Grudge racing on Friday night, but neither happened due to inclement weather. The Memphis International Raceway staff did an admirable job of clearing off the water and even had the track ready to go by 6PM on Friday. They had rosin down and were dragging the track when once again the sky opened up one too many times. At around 7Pm, racing was officially called off on Friday. Yet all things considered, the race was a success for the sanction. The remainder of the event proceeded without weather related issues once racing began on Saturday morning. Racing into the Memphis night. Sportsman class qualifying began the day on Saturday, with the professional classes hitting the track during the early afternoon in the heat of the day to begin racing. Heat was a factor for all the racers throughout the weekend. 90 degree temperatures, coupled with high humidity, kept everyone sweating profusely. MANCUP’s announcer Bill Hahn Jr. did well reminding people to stay hydrated. Bill also did a stellar job announcing the race, start to finish, both days. It’s a grueling task to talk on the microphone pretty much non-stop for close to 12 hours on two consecutive days. By Monday, I’m sure his vocal cords felt a lot like a discarded drive belt (well used and abused). 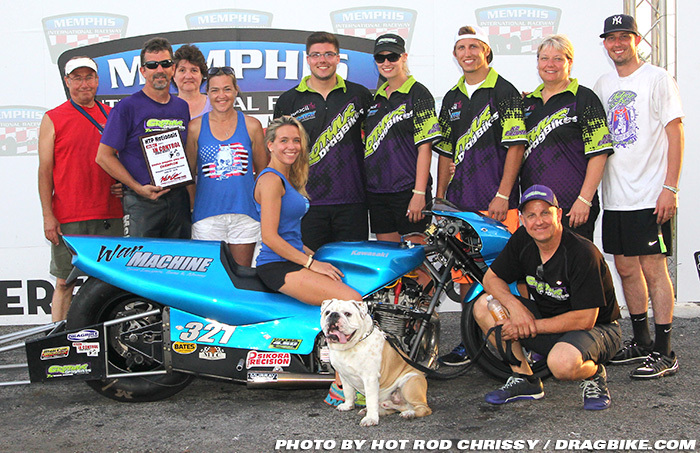 Top Fuel motorcycle veteran, Larry McBride, can hold his head high for his team with another win in Memphis. 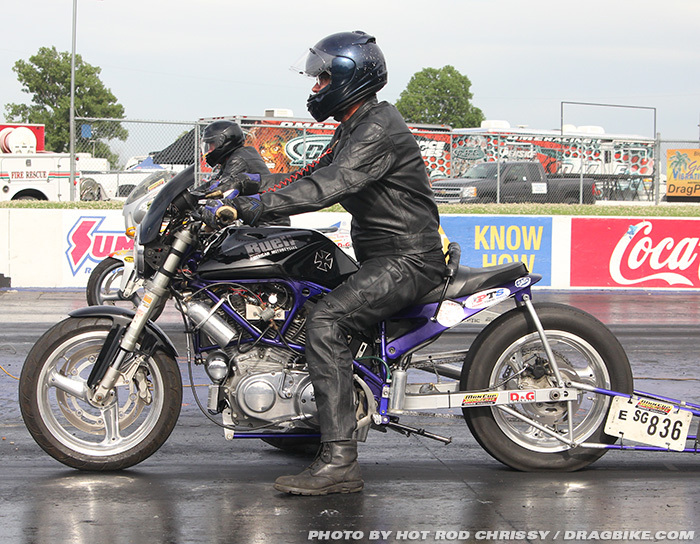 Larry took his solo run in style with a 6.04 up on the board, and this was followed by a surprising red-light start by Dave Vantine who was facing Korry Hogan on the new ATF-1 machine. This put Alwine Racing into the final round against the Cycle Specialists machine. While Larry defeated Korry Hogan soundly, 6.18 to 6.92, the race was a tremendous moral victory for Alwine Racing. To show up at their first ever race with their new home grown motor, a brand new bike, qualify for the field and making a final round appearance; not a bad start for the team. At the next race in Rockingham, on August 22-23, it will be interesting to see these teams clash once again. In Falicon Pro Modified, with eleven bikes entered, Travis Davis led the way with an elapsed time of 4.11 at 175.34 to the eighth mile clocks. This earned Travis a bye run in round one of eliminations. In round two, Travis had the misfortune of running into Brunson Grothus who strapped a perfect .000 reaction time on his .112 rt, to send him packing. Travis had a quicker elapsed time with his 4.13 to Brunson’s 4.16 but the perfect reaction time by Brunson was the perfect solution to the problem. However, too close is sometimes too close in drag racing. In Brunson’s next outing he fouled out with a -.007 to Jeff House who then advanced to the final round. In the mean time, Chuck Wilburn took out Darian G. and Richard Gadson earning him a bye into the final round against Jeff House. Jeff took it to the tree in the last round with a too-quick reaction time of -.003 ending his day, while local racer Chuck Wilburn, of Tupelo, Mississippi, took the win in Pro Mod. In APE Pro Street, 18 bikes were present ready to romp and stomp. 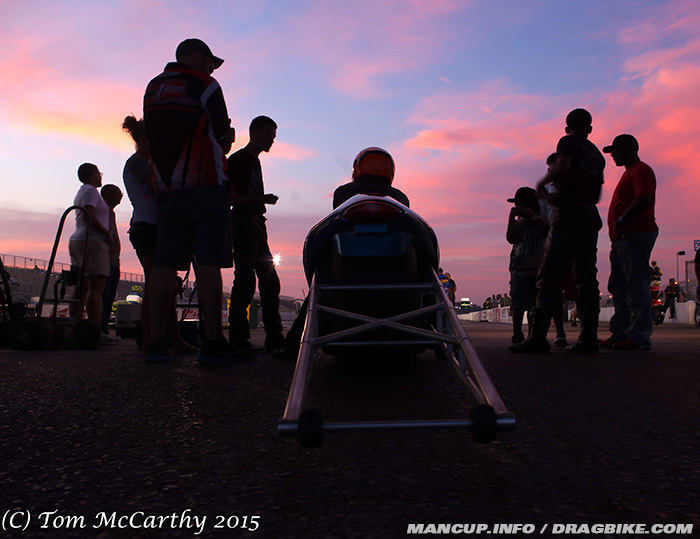 Qualifying was lead by Joey Gladstone, sponsored by Vance & Hines Racing and DME Racing. 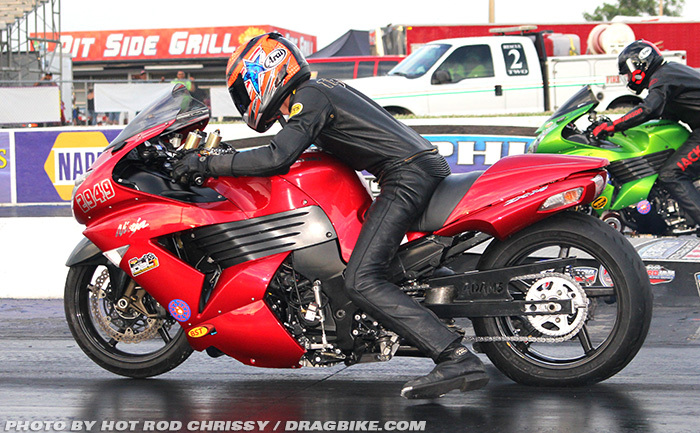 Joey’s 6.95 at 213 mph was good for the top spot with the bike already outfitted to the latest rule revisions in Pro Street that were enacted prior to the race. 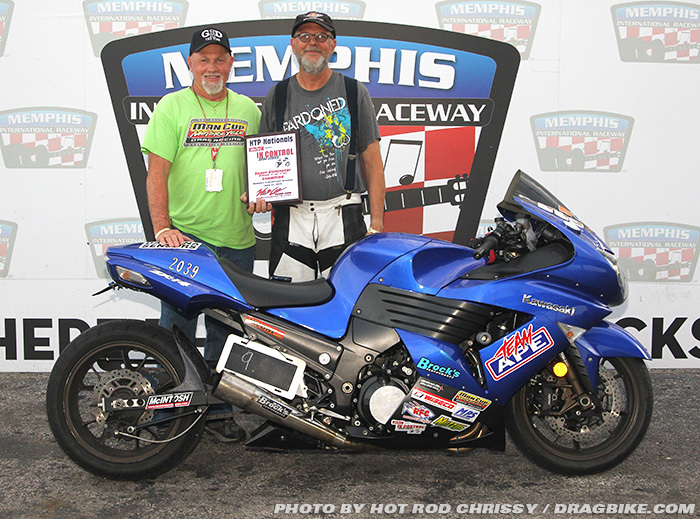 It’s interesting to note that only two Pro Street bikes, both DME powered and tuned motorcycles, Terrance Angela and Joey Gladstone, were in the six’s at Memphis. There’s much to be said for pre race testing and tuning. While it’s clear that Joey Gladstone driving the team DME bike, outdistanced Ryan Hable in the final round for the win, 6.91 to 7.45 respectively, Ryan Hable racing won a great measure of respect from their peers with their runner-up finish. Ryan defeated Keith Dennis, Jeremy Teasley, and Rudy Sanzoterra to meet up with Joey Gladstone in the final round. 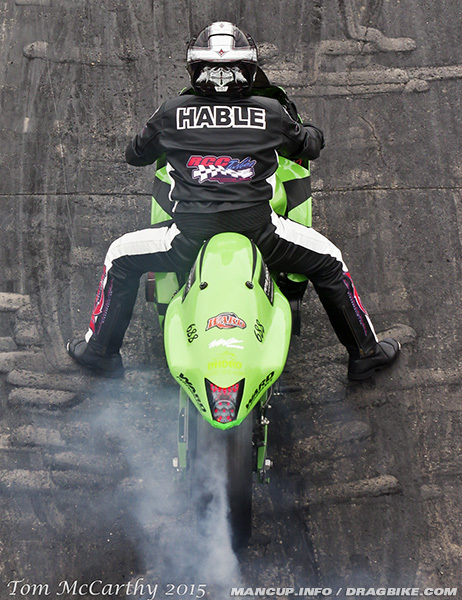 Hable Racing for 2014 finished 31st out of 42 teams in the points series. One year later, they are on pace for a deep top-ten points finish easily. 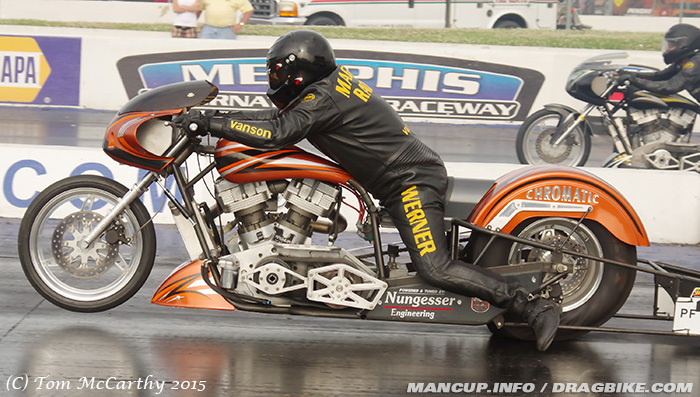 Ryan Hable had his best outing in Pro Street, with the MANCUP sanction at Memphis. 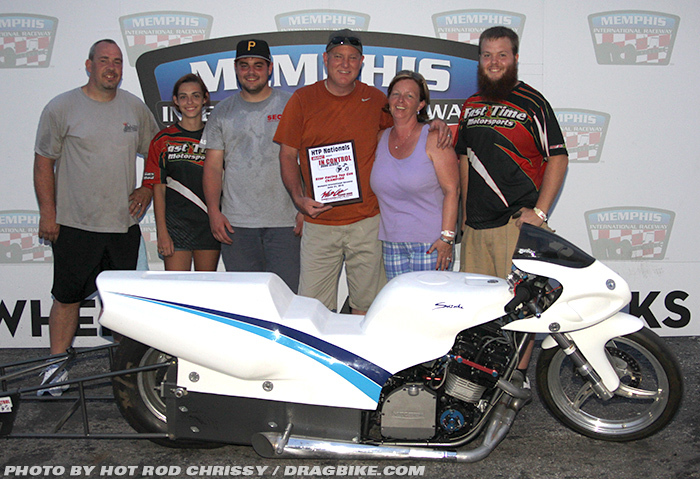 The Hawaya Racing/S&S Performance Pro Fuel class at Memphis was well represented with eight teams present. With so many choices available to racers nation wide right now, it was great to see the racers in this class supporting the MANCUP sanction. 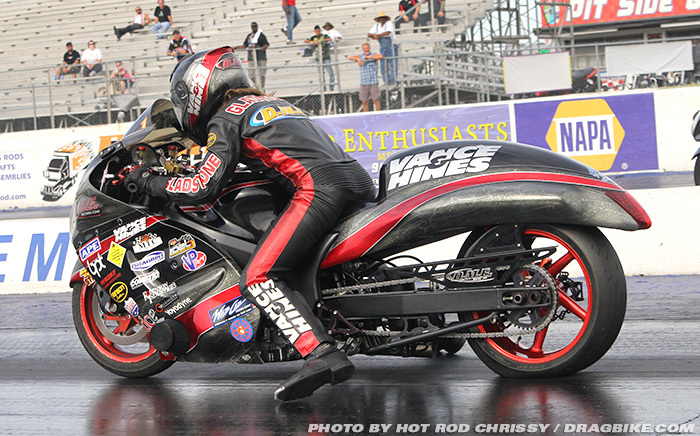 When the smoke cleared from qualifying rounds, Rocky “Rockstone” Jackson, sat in the number one qualifying position with a fine 7.27 elapsed time @ 171.34 mph. Rocky had the field covered by better than a tenth going into elimination rounds while Dustin Werner had the high mile-per-hour mark with a posted speed of 177.77mph. Rocky took out Seth Hooper the number eight qualifier in round one, but was eliminated in round two by Jordan Cruz. Rocky had a slightly quicker 7.44 to Jordan’s 7.45, but the .065 reaction time by Jordan Cruz strapped a big hole shot on Rocky’s .174 (rt) and Jordan powered on by for the win. In the other semifinal round match up, Dustin Werner took out Janette Thornley, 7.39 to 7.61 respectively. Dustin Werner took a hole-shot win over Jordan Cruz in Memphis. In the final round, Dustin Werner, defeated Jordan Cruz soundly with a .082 (rt) to Jordan’s .291, then stopped the clocks with a 7.37 to Jordan’s 7.51 to seal the win. Werner’s win on Sunday was text book excellent fuel bike racing. He posted round numbers of 7.38, 7.39 and 7.37 along the way to his first MANCUP racing event win. In Cooper Performance Pro Open, sixteen bikes were entered into competition for Sunday’s race. In the number one qualifying spot was eventual event winner Mark Rendeluk with a stout 6.63 elapsed time. 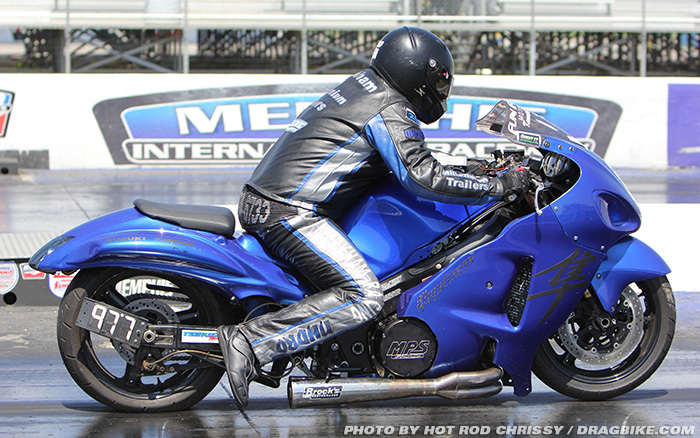 Joey Gladstone, on the DME prepared bike delivered high mph in qualifying class with his 220.84 blast. Notably, Rob Giard made the 1234 mile trek from Ware, Massachusetts, to Memphis International Raceway, with his family, as he continues to work as hard as he can to defend his 2014 Pro/Open championship #1 plate. Rob has been turning up the power first then seeking the rest of the combination to drive deep into the six’s ever since Joey Gladstone on the DME powered bike posted a 6.50 last November. As indicated by Joey’s 220mph run in qualifying, racers in the class know that being in the six second elapsed time zone is not enough to assure a win in this class. Sub six-fifty elapsed times are likely to be seen before this season is out. Mark Rendeluk on his sleek Timbiln Chassis bike was the picture of consistency in winning his class on Sunday. He clocked 6.70 in round one, followed by a 6.66 elapsed time in round two, another 6.66 in round three and a 6.65 in the final round to defeat runner-up Vince Testa who had a stout 6.95 at 193. This puts Rendeluk in contention with Rob Giard for the P/O championship race going into race three of four at Rockingham next month. 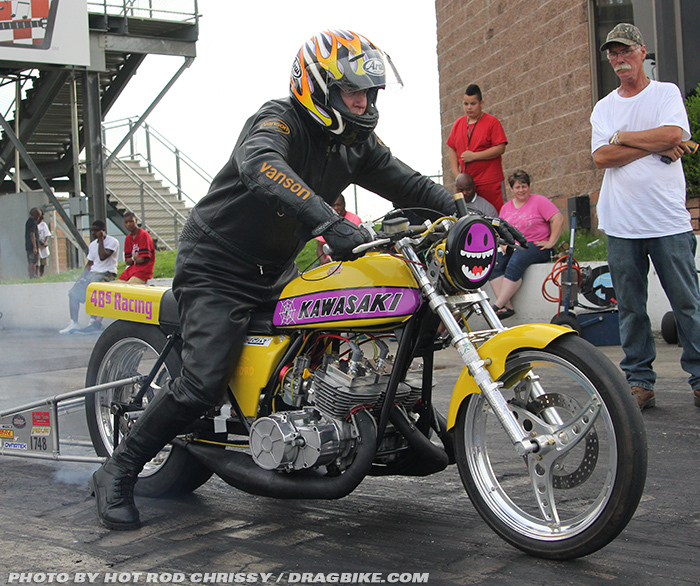 In Shinko/WPS Real Street, eleven bikes entered the fray, with Roger Starrette notching the low qualifier number with a 7.73 elapsed time. With the odd number of entries to the class, this gave Roger a bye run in round one. He then took out Troy Jackson in round two, but fell victim to Anibal Merced in the semi-finals when Anibal put a gate job on Roger with a perfect .000 reaction time. Roger had a quicker 7.96 to Anibal’s 7.99 but Roger’s .056 (rt) was his undoing. In the final round, Anibal’s quick reaction times became his undoing as he fouled out (-.006) to Jeremy Teasley who took the win. Jeremy finished number two in the championship points for the 2014 season behind Ricky Gadson. Jeremy is out to correct that in 2015 MANCUP racing action. Also Real Street saw a new entry as Ben Knight made his Real Street debut. While he is still struggling with his set-up, there is no doubt he will become a contender by the end of the season. In Grothus Dragbike Ultra 4.60 class, action, Roderick Sanders Jr., was the low qualifier against the 4.60 index by running a 4.611 elapsed time. Twelve bikes entered in competition for the weekend. In round one, Roderick eliminated Mike Arrington of Glen Heights Texas who broke out with a 4.53 ET. In round two, it was Sanders turn to pack it in after Les Stimac defeated him with a hole shot. Les found himself with a bye run in the semi finals as he faced Dan McCarten in the final round. McCarten chopped the tree on Les with a .013 reaction time to Les’s .086, and that was all she wrote. Dan McCarten was off to the winner’s circle. In this the first season of Grothus Dragbike Ultra 4.60 class racing, Les Stimac was the points leader coming into this race after the rain shortened MANCUP season opener at SGMP. By coming into Memphis with a 72 point boost and going to the final round of racing, Les may not have won this battle, but he’s in a great position to win the war at season’s end. In Star Racing Top Gas, 29 bikes entered the class with Chris Dodson, of Marion, IN looking good posting an 8.203, running closest to the index. This gave Dodson a single in round one and in round two, he faced Ron Morris who delivered a .000 reaction time to Dodson’s -.002 light that ended his day of racing. Morris then went on to cut through field like a knife. He eliminated Jeff Jones and Heather Baldi on his way to the final round to meet Chad Otts, the current #1 plate holder in the class. In the last race of the day, Morris again chopped the tree down on his opponent. His .018 reaction time to Chad’s .079 was the death blow that caused Otts to stay in the throttle just a bit too long on the top end as they hit the stripe with Morris showing an 8.22 on the board to Chad’s 8.19, giving the victory to Ron Morris. 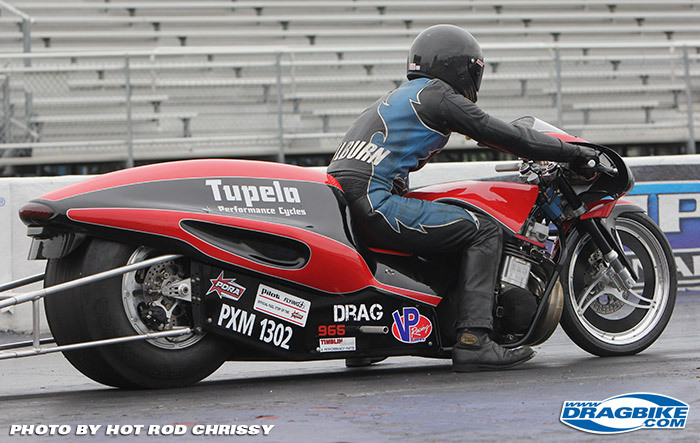 In MTC Engineering Super Comp, 28 bikes entered the class at Memphis International Raceway. Running closest to the 8.90 index was John Markham of Bowling Green, Kentucky. John raced Mike Hudson in round one, and Hudson’s 8.82 break out pass ended Hudson’s bid for victory. In the next round, John ran against Luke Slemker who was on a roll this race. Slemker took out Mac McKnight with a 8.90 on the 8.90 index in round one. He defeated Markham in round two, did a competition single in round three and in round four defeated Chase Morris who fouled out with a -.014 light. While Slemker looked to wrap it up this race, his final round opponent, Ron Arnold had other ideas and it was Arnold who delivered the winning combination of an .026 (rt) with a 8.97 elapsed time to Slemker’s .127 (rt) and 8.86 break out run. In World Wide Bearings Crazy 8’s action, Ben Knight was the closest racer running on the index by carding an 8.884 in the preliminaries for the 31 bikes entered into the competition. Ben had a solo in round one and eliminated Danny Ingram in round two, who broke out. Ben’s day ended in round three against Ron Arnold in a tight race to the stripe. But the winner of the day in this class was Luis Hornedo, of Orlando, who took top honors for the class. Luis defeated Luke Slemker, Tommy James, Tim Hubbard, and Ron Arnold to battle to the final round late Sunday evening. In the last match up, Luis had a slight edge on the tree with a .062 reaction time to Dustin Lee’s .076 (rt) and it was a battle for 1320’ to the stripe with Hornedo posting an 8.901 to Lee’s 8.906 for the closest race of the day. A great reward for Hornedo’s 12 hour drive to the race on a new and untested bike. 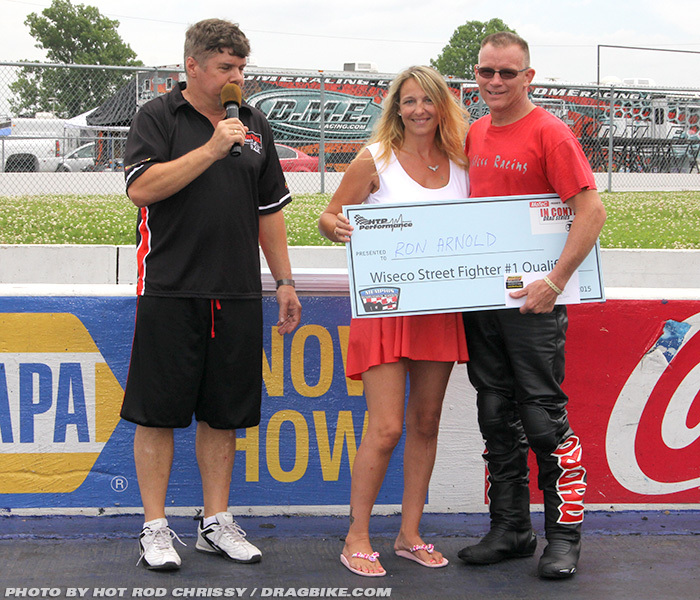 In Wiseco Street Fighter action, 33 bikes entered the fray with Ron Arnold sitting atop the 9.90 index class. Ron had a solo shot in round one and advanced as far as the semi-final round. Dustin defeated Charlie Brown, Stephen Knight, took a solo shot in round three, defeated Butch Million in round four, Tyler Fisher in the semi’s and knocked off Wes Brown in the final round for the win. Butch Million finished #2 for 2014 points and will be fighting hard for the #1 plate this season. In D&G Chassis V-Twin racing, 12 competitors battled it out in two separate races on Saturday and Sunday. In Saturday eliminations, Michael McManus won over Larry Zientek and Clint Riley to take on Chuck Boothe in the final round. McManus got an easy win be Chuck red lit his chance away of making it the winner’s circle. 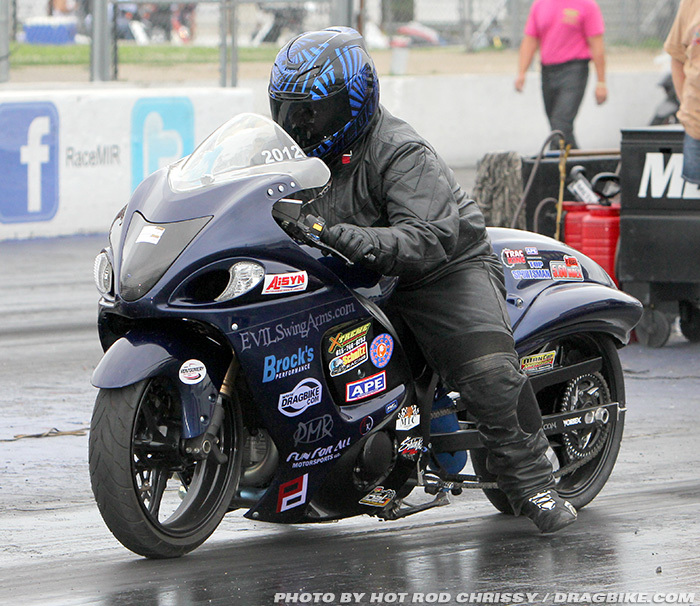 In Sunday eliminations took his 2008 Buell to victory after defeating Chuck Boothe, Johnathan Cole, andDon Leslie until he finally faced off against Robert Salem in the final round. Houdyshell defeated Salem with a better reaction time making him a Sunday winner. 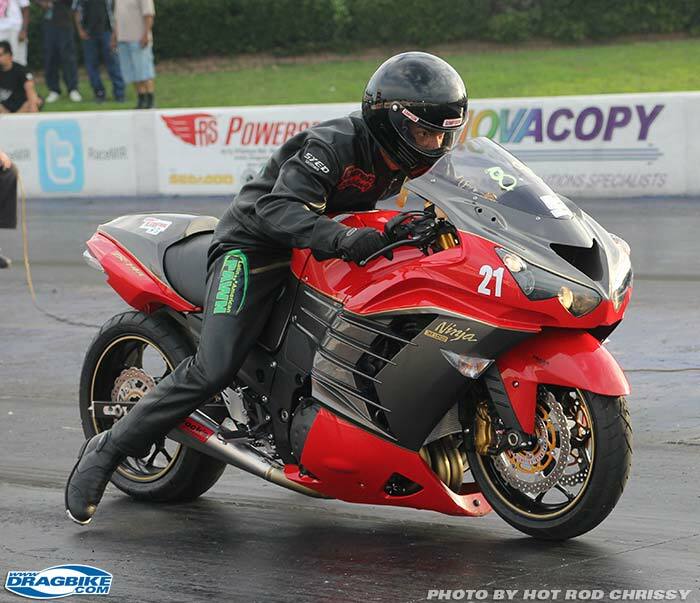 In Fast By Gast Super Eliminator there was a lot of exciting racing action with a variety of motorcycles for a 72 Kawasaki H2 to a 2009 Hayabusa and everything in between. The most exiting action of the weekend was the record breaking action of Garret Wood in the DD/M-HH (780cc to 809cc/Modified-Heavy Hitter) category. Garret broke the previous record of 9.59 with a 9.02! Back to elimination action, Roy Johnson dominated every round with his consistent performance defeating Scott Allen, Sol Barnett, Larry Zientek to face off with Spencer Greer in the final. The Texas racer, despite cutting a better light, was unable to fight off the better running Johnson in the final round. In MPS Racing Pro ET Saturday action, Jon Haney won 5 rounds before making it the finals against veteran racer Mark Abrams from Illinois. Jon took the win over Mark with a better reaction time that forced Mark to break out as he took the stripe first. In MPS Racing Pro ET Sunday action, John Markham, was on fire as he won every round with incredible double-o reaction times. He faced off against Lee Ackerman in the final round and gave him another .002 reaction and took the win. In Muzzy Street ET Saturday action, Stephen Knight had the race of his life. 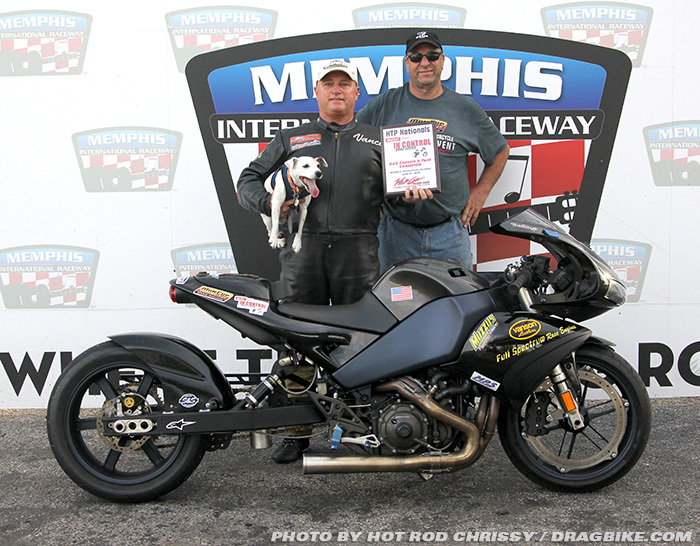 Not only did he win 7 straight rounds to take out the 2014 Dragbike.com BAMF of Jeremy Teasley in the final, it was also his first motorcycle drag racing win ever! The DRR team inducted Stephen into the ‘gang’ after that win with a ice cooler bath! We are pretty sure Stephen didn’t sleep that night! In Muzzy Street ET Sunday action, John Markham and Boo Brown were both on a fierce battle to meet in the final round after both winning 6 rounds! Brown cut a better light against Markham but it wasn’t enough to beat John’s perfect pass with a ‘dead on his did’ run!